Few things better demonstrate a fast-food restaurant’s efficiency than its effort to accommodate a customer base who is unwilling to leave their cars to get their food. Carl’s Jr./Hardee’s knew this as well as anyone, and this training video shows how much they wanted to be able to claim their tight drive-through game as a feather in their cap. An otherwise featherless cap, given the competitive fast food landscape of the 1980s. The video makes the baseless claim that Hardee’s has the fastest drive through in the industry, then immediately walks it back by saying that’s what they’d want to be able to claim. That’s not how making claims works! The video’s pretty thin when it comes to specific tactics, as well. The “A” in A.C.T. 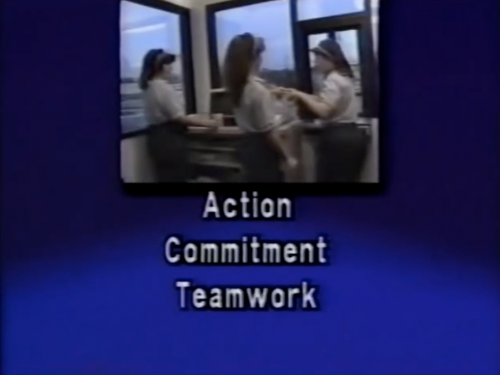 stands for Action, described in the video as an effort to “take the order right away”. “C” is for a Commitment to serve the order as quickly as possible, and “T” is for the Teamwork you need to work together to accomplish it. None of these are trainable action items; this video is less of a ‘how to do your job’ instruction than it is a rundown of the benchmarks of a job well done. There are a few specific tips given in the video, like the go-between from the kitchen to the window is encouraged to fill several orders at once as the food is being cooked. I can’t imagine this worked well for any but the most skilled go-betweeners and probably resulted in a lot of disappointed drive through customers having to park and walk inside to complain. The cast is fine, if a little stiff. Again, unremarkable. There’s no cheese pushing this video over the top and when you look at this in a world that gave us “Grill Skills” and even “Making it Great“, it’s easier to see why Hardee’s never really pushed through to a top-of-mind restaurant. There’s no overarching personality to the brand that branches out into the looks and feels of things like training videos, and as a result everything just comes up flat. 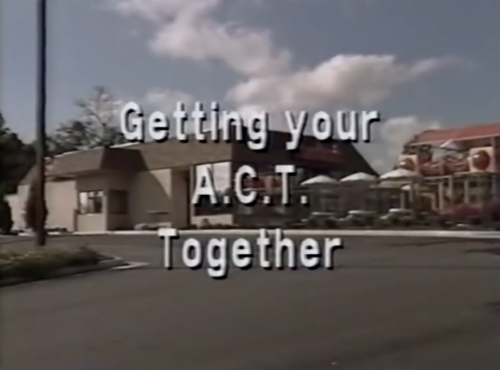 I had higher hopes for a video as cleverly titled as “Getting Your A.C.T. Together”. Am I being too harsh? Judge for yourself.